Home » Hot Zone Blog » Can the planet sustain 7 billion people? Can the planet sustain 7 billion people? 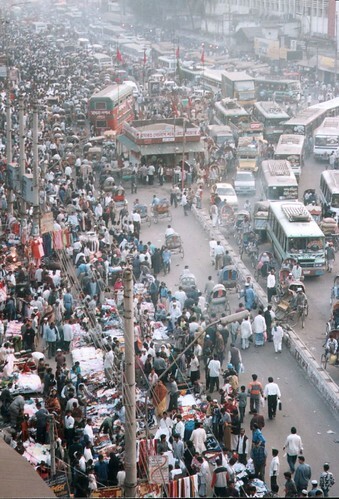 The world’s human population is expected to hit 7 billion people by the end of October. Almost no one is taking that number in as cause for celebration. In fact, 7 billion comes with quite a bit of angst, since 8 billion is projected in a mere 15 years and 9 billion by 2050, says the U.N. The U.N.’s assumption is that the world can absorb all these new people. But does the demographic forecast doesn’t square with the environmental one? Humanity long ago overshot its sustainability. And while the catastrophe envisioned by scholar Thomas Malthus has been repeatedly revived (remember dire warnings of the “Population Bomb” in the 1970s that failed to materialize? ), climate change these days adds more cause for concern. Some experts foresee a bleaker picture in which climate change and limited natural resources, like arable land and water, finally put an end to the global human growth rate. “The growing imbalance between the increasing world population and the finite amount of Earth’s resourcesÂ that support human life is reason for grave concern,” says David Pimentel, a Cornell University professor of ecology and agriculture. He writes that 3 billion of today’s people are malnourished, an amount he expects to grow over time as resources become more strained. Most of the births these days are in developing countries, where fertility rates remain sky-high but vulnerability to the effects of climate change are heightened. Statistically speaking, the 7th billion baby is likely going to be born in the most populous state in India, Uttar Pradesh, according to children’s rights group Plan International. Perhaps the human population will continue to grow, in spite of these constraints. But what will life look like for many of these new people? The cost of unchecked population growth is a reason to look at 7 billion quite soberly. Is it better to plant trees or not?